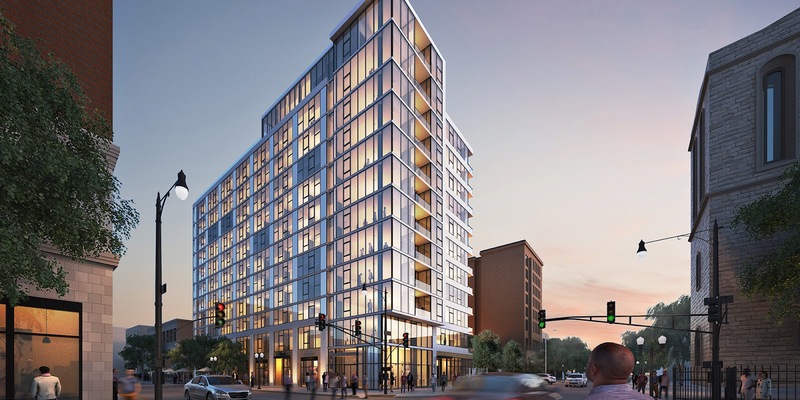 4555 N. Sheridan, the transit oriented development from CRG, received its full building permits yesterday, which means it has been cleared to rise the full 12 stories by the city. Only 29 parking spots in a 149 occupied!? This will be a problem eventually. How so? People who have cars will take one look at the street parking situation and choose somewhere else to call home if they can't get one of those 29 spots. This is 2 blocks from the Wilson L. It will attract car-less residents who want close proximity to public trans. Exactly. There are also monthly parking garages across the street on Wilson and another on Broadway. They aren't at capacity. Everyone who complains about parking wants free street parking, and no competition for it. 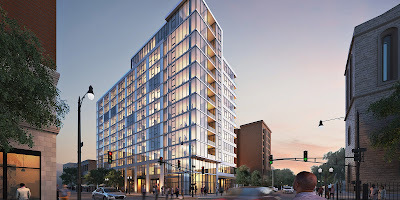 Can someone remind me how many of the built apartments will be "affordable" or set-aside to help ensure that the longterm resident's of Uptown are not priced out of their own neighborhood by these highrise towers boasting their luxury amenities at inflated rates? Are they actually building affordable units in this building or were they also allowed to throw some money into a NIMBY pot to have "affordable" units built else where in the city so as to ensure that "undesirables" are run out of Uptown? I can remind you. This is a former fast food restaurant, and before that it was another fast food restaurant. Formerly, it house zero affordable housing units. Now there will be 149 homes, where before there were zero. Perhaps all of them will be market rate, which will provide a taxbase to support the indigent families that already live here, plus the families that should live throughout the city. Why does it have to be the former site of Burger King/Pollo Loco to make you happy? Onsite affordable goes to people earning 60% of the Area Median Income, meaning a single person must earn around $32,000 yearly income to qualify to live in an onsite affordable unit. It lasts for 30 years and then turns into market-rate again. When a developer pays into the program for offsite, those funds go into 2 different pots of money: 1/2 goes to build more affordable housing and the other half goes to pay rental subsidies to people earning between $0 to around $16,000 per year. The 46th Ward ranks #1 with having the most of these Low Income Housing Trust Fund (LIHTF) rental subsidy units.... we have more than the combined total of 28 other wards. I recently helped a young sight impaired man and his mother (unable to work because she's not a citizen) obtain a LIHTF rental subsidy in Uptown paying 1/3 of his SSI check: his total rent for their apartment is $250. They would never qualify for an onsite unit because he earns 15% of the AMI rather than 60%, but they did qualify for offsite. You can't find any market-rate rents for $250, so it was a lifesaver for them.